And again, another year is ending, loads of challenges accomplished, lots waiting for next one. 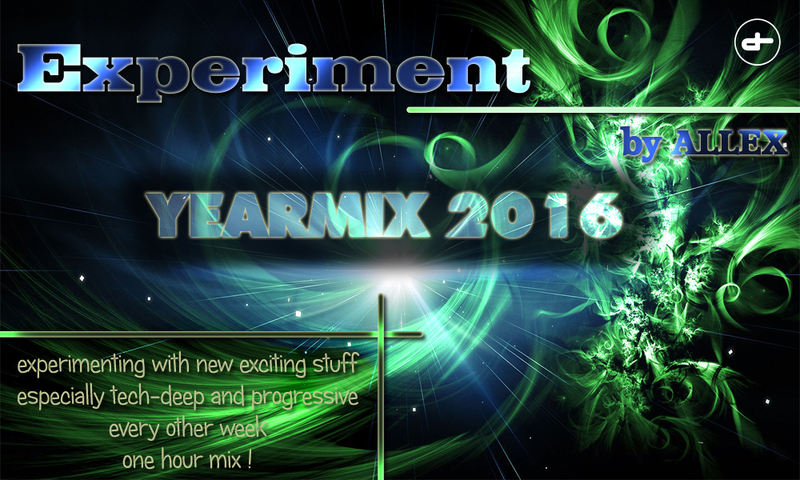 For Experiment it was another massive year, full of brilliant tracks from pioneers of music or new talents but also big amount of productions from our resident and Experiment ambassador Allex. Big thank you for all your support and feedback from last 12 months and hope we will be able to bring you more emotions and joy in year 2016 of course by music. 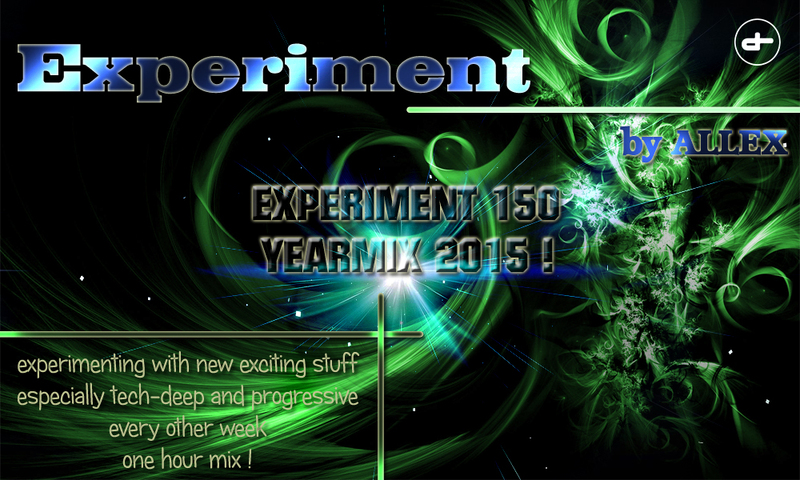 As a big thank you is as always a selection of the best what you heard in Experiment in last year. 80 tracks used, lots of new mashups, edits and mixes has been made. This is YEARMIX 2015! Note: Download will be available for limited time. So, that time has finally come ! End of the year is always exciting not just because of Christmas of NYE but always because people like to count and remember what was that year about. Loads of adventures, trips, life changes or situations which took our breaths away ! And of course, music, which hook our minds to the different level, full of emotions or massive club tools, which makes you scream ! Our long-term resident Allex did what he always do every year and that is his selection of the best tracks from his podcast Experiment ! Every year it has to be more exciting, so there is bigger amount of tracks in one hour as last year ! Allex made his choice, and here is his top 79 tracks from last year mixed in hour marathon mix, full of emotions, classics or tech and aggressive music, which made his year 2014 ! Hope you enjoying days off, Christmas and of course hope you will enjoy NYE and all your wishes come true ! From 115 BPM to 135 BPM, Indie Dance, Deep, Tech, Progressive ! Well Allex would like to thank you for all great support and feedback, it’s always a pleasure for him to mix a new one hour of Experiment and show people some new stuff ! Hope you having a good time already, have a nice peaceful Christmas and enjoy celebration of New Year ! see you all in the next one !!! 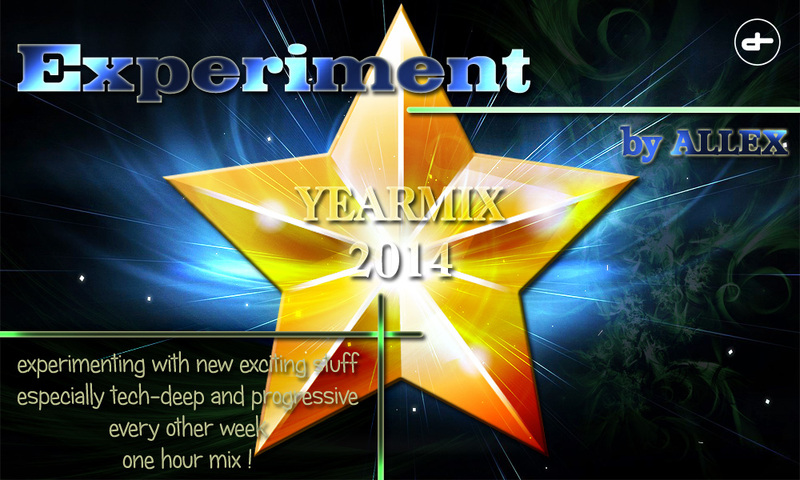 So, here is a special edition of Experiment – Yearmix 2012 ! 47 tracks in 1 hour megamix ! Allex want to thank to all the guys, producers and djs which made every single episode of Experiment a little bit different and he was able to show people different types of music, feelings and emotions ! Well for him, here is 47 epic tracks which made his year awesome ! Indie dance, deep and tech house, progressive, all you want ! one of the best years, if he talking about music ! Some new remixes was released, couple of new collaborations, but mainly, still working on his debut artist album ! You can expect many of promos soon ! Well, how many tracks you can put into one hour? Yes, it depends … So, for you tonight, it’s number 29 ! 29 tracks, which most resonated in his head ! First half is more tech and second half is full of progressive and trance !